Welcome to Jester's Diner. We are now in our 17th year and are constantly evolving our surroundings, food and service. To simplify things a little we now offer ONE menu available both daytimes and evenings. We also now deliver up to 5 miles away daytimes and evenings too!! (so yes we can now deliver daytimes to all areas). In summer months when the traffic is heavy, please be patient as we can only go as fast as the car in front! Whether you are popping in for a take-away cappuccino and a bacon roll or sampling one of our famous breakfasts, we aim to serve you the freshest homemade food possible. With WIFI in our modern air-conditioned 56 seat restaurant. so why not just chill out with a fresh coffee in our comfortable lounge area. As well as a large free carpark and friendly staff, at Jester's we never stand still and are constantly trying new ideas and dishes. 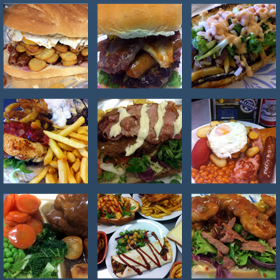 Follow us on Facebook and twitter (jestersdiner) for special deals and offers as well as up to date news on our daily specials and forthcoming events. We also now accept most major credit cards and we have state of the art gprs chip and pin machines, so you can pay on your doorstep without having to give your card details over the phone. How cool is that!